By Audrey Golden. Dec 29, 2017. 9:00 AM. Earlier this year, we had the pleasure of visiting Ulysses Rare Books in Dublin, Ireland. We were so thrilled to see some of the most interesting rare first editions of the most significant works of Irish literature in the shop, from those of W.B. Yeats to James Joyce to Seamus Heaney. We were lucky enough to learn a bit more through an interview with one of the shop’s co-owners, Aisling Cunningham, who runs the bookstore with her brother, David. Books Tell You Why: We read that your father started the bookstore, then Catach Books, in 1969. What led to his interest in selling rare books? And how, in turn, did your own interest in selling rare books develop? Ulysses Rare Books: Our father was a private collector for years. He was a primary school teacher and this was his passion, so he then began to deal privately by catalogue and built up a good collection of books. After he took early retirement he decided to open a shop in town. He opened a small shop first in 1986 and then as his business grew he decided to move to this location in 1988. David and I were between jobs and finished education so we decided to help him at the beginning just temporarily at first, but 29 years later we are still here! Books Tell You Why: When we visited, we were floored by your incredible collection of Irish literature. When the bookstore first opened, did it tend to focus on rare works of Irish literature? Ulysses Rare Books: The business always focused on books of Irish interest with our main interest being Irish literature, but we also had a good collection of early Irish History books. This has changed over the last 29 years as we have moved more towards Irish Literature and have a much smaller History section. We have also increased our Illustrated Children’s Section. We would really specialise in First & Signed editions of James Joyce, Oscar Wilde, W.B. Yeats, Samuel Beckett, and Seamus Heaney. Books Tell You Why: Could you tell us a little bit more about the W.B. Yeats collection? What are some of the rarest items in the collection? Some of the most interesting? Ulysses Rare Books: The Rarest Yeats item in stock at this time is probably Is The Order of R.R. & A.C. to Remain a Magical Order? Inside it states that “This Essay must not be given to any but Adepti of the Order of R.R. & A.C.” It was written in March, 1901, and given to the Adepti of the Order of R.R. & A.C. in April 1901. Very rare essay by Yeats. 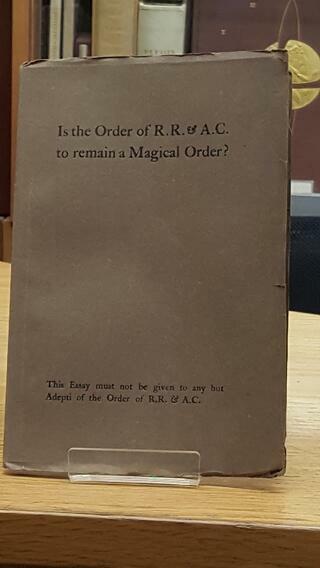 The Order Rubidae Rosae & Aureae Crucis was apparently a section of the Order of the Golden Dawn, the mystical society to which Yeats belonged. Each member adopted a motto, usually in Latin, and was known in the Order by the initials of the motto; Yeats's adopted name was 'D.E.D.I' (Daemon Est Deus Inversus). We also have a First Edition of The Shadowy Waters, which is Inscribed by Maud Gonne on front free endpaper to a friend. Copies of Yeats’ works inscribed by her are very rare. Ulysses Rare Books: The rarest Joyce in stock at the moment is a first edition of Ulysses, printed in Paris by Shakespeare & Co., in 1922. It's in the original blue wrapper covers. There were only 1000 copies published, the first 100 were signed by James Joyce and the next 150 were on a special verges d’arches paper, and the remaining 750 were published on hand-made paper. We also have an illustrated edition of Ulysses printed in New York in 1935 and illustrated by Henri Matisse. It is one of only 250 Copies Signed by James Joyce and Henri Matisse, [from a total edition of 1500 copies]. The 26 beautiful full-page illustrations by Matisse accompany the text of Joyce's Ulysses, including six soft-ground etchings with reproductions of the sketches on blue and yellow paper. Joyce only signed about 250 copies; apparently irked that Matisse’s illustrations depicted the characters from Homer’s Ulysses, not his own version of it (see below). The publication was oversubscribed and copies bearing the signatures of both Joyce & Matisse were highly sought after by members of the Limited Editions Club. The publishers intended to hold a lottery among its members to decide who would receive a double-signed copy, however they were prevented from doing so by New York State law. Matisse had never visited Ireland and so Joyce asked his friend and fellow Dubliner, T.W. Pugh, to send him an illustrated magazine from 1904, the year in which Ulysses is set, so that he could correctly render the details of Dublin life. However, Matisse chose to base his etchings on Homer's Odyssey, depicting the Calypso, Aelous, Cyclops, Nausicaa, Circe and Ithaca episodes of the poem. When asked why he had not illustrated the events of Joyce's novel, he replied: 'Je ne l'ai pas lu' ('I have not read it'; Ellmann, 686). Nevertheless, his etchings for this edition are outstanding examples of his art, offsetting strong, neo-classical figure drawing with a sparing use of half tone. The etching of the blinding of Polyphemus by Ulysses is a particularly powerful image. Matisse's preparatory sketches between two and five for each etching, printed on yellow and blue sheets of various sizes are in several cases very different from the finished image. 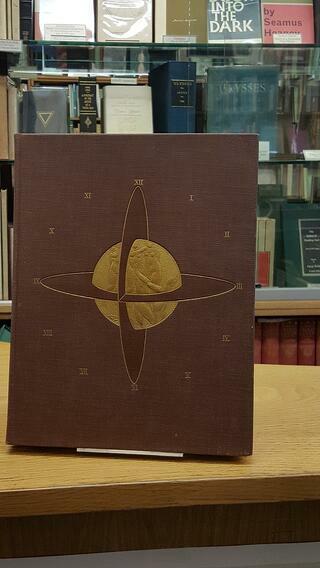 Ulysses Rare Books: We have a large collection of Seamus Heaney, the rarest would be Eleven Poems, published in Belfast by Festival Publications in 1965. It's a scarce first issue of Heaney's first book of poetry, which was published before Death of a Naturalist. Seamus Heaney was in our shop quite a few times in the past, and was exactly as you would expect, a real gentleman. Books Tell You Why: You have a collection of items from Ireland 1916-1923. Are there a number of collectors in Ireland who focus their collections on Irish independence? How about collectors from outside Ireland? Ulysses Rare Books: Last year during the Anniversary of the 1916 rising we did have quite a few people looking for books from that era. There was an increased interest in that period of Irish History and we made sure we had plenty of original material to offer collectors, having accumulating books for the previous couple of years. Most of the people collecting would be Irish, either living here or abroad. Books Tell You Why: Finally, when collectors come into the store, are there specific items that they tend to be seeking out, or do you find a very wide range of collectors and interests among them? And are most of the collectors who come to the shop from Ireland? From other places in Europe? Elsewhere? 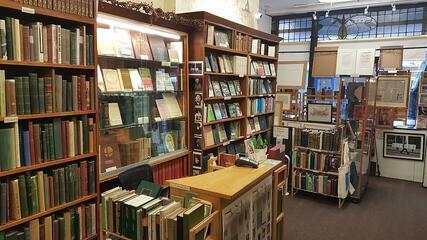 Ulysses Rare Books: We have found that over the years the interests of our customers has changed. We have more collectors of first editions of literature and illustrated books. We also have found that many of our sales are people buying a special gift. We would have government departments looking for a special gift for a visiting dignitary or a company looking for a retirement gift for a member of staff. Buying first editions of children’s classics as Christening gifts has also become quite popular with us, so we always try to have a nice selection in stock, from first editions of Peter Pan illustrated by Arthur Rackham, Alice in Wonderland illustrated by John Tenniel to more recent titles of Matilda and Charlie and the Chocolate Factor by Roald Dahl and even more recent first and deluxe editions of J.K. Rowling’s Harry Potter series. Most of our customer base is here in Ireland but we do get daily orders from our website from the US and UK. Many thanks to Aisling Cunningham for taking the time to tell us more about Ulysses Rare Books!